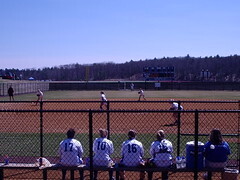 Katie and I went to see Wellesley's first varsity softball team at their home-opener today. I don't know why it's taken Wellesley this long to come up with a varsity team, but it was worth the wait. That underhand pitch is wicked, and Wellesley is the perfect place to enjoy a beautiful spring day and some sports. We listened to the Sox game on the way home, and that was fun, too (especially when Ortiz ripped the 3-run homer while we were in the middle of Rt. 9 and I pounded on Katie's dashboard). Unfortunately, it didn't end so well. It's a long season, people. And I'm going to love every minute of it.